From the writer of "Fire By Night" and the winner of SU's fiction competition comes another fiction story set at against the background of a great Bible adventure. Sekani and Tabia live in Jericho. They are great tricksters, but when they notice foreigners arrive at their Aunt Rahab's house, they find themselves having to fool the king's soldiers as they hide these men - Israelite spies! Not convinced the spies will protect their family when Israel attacks, they set out from the city to find the spies and get reassurance. Gurion and Daya are Israelite children from the tribe of Asher. Gurion is frustrated by his father's lack of confidence in him and sets out across the plains to make a name for himself in the battle against Jericho. Trying to stop him making a big mistake, Daya sets out after him.In the deserted fields of Jericho the four children meet and both pairs realise that they are in the wrong place. To play their part in God's plan, they need to be back home - Sekani and Tabia in their aunt's house, Gurion and Daya with Israel. The children realise that they have followed their own ways, rather than what God wants and face a struggle to get back. As the Israelites march round the walls of Jericho on the seventh day with Gurion among their number, Sekani and Tabia hang from a rope beneath the window marked with a scarlet cord. Daya is hiding in the fields, watching the Israelite army get nearer and nearer... Through this fantastic adventure story, children aged 9+ will be able to explore the story of Joshua and Jericho from the point of view of children like them. They will investigate what it means to be part of God's bigger plan, and how sometimes we don't understand or want to do something we think is more exciting. They will encounter the idea of promises of protection and how God never breaks his promises. 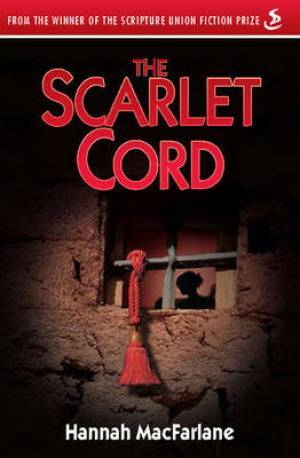 The Scarlet Cord by Hannah MacFarlane was published by Scripture Union in April 2009 and is our 2248th best seller. The ISBN for The Scarlet Cord is 9781844273706. This is the story of a brother and sister who live in Jericho and a brother and sister who are members of the Israelite tribe of Asher, living a nomadic existence since the Israelites escaped from Egypt many years before. To begin with we are told their stories alternately, but as both pairs seek to help their people by going it alone, they meet and find that they would have been more help if they had stayed with their families and that would have been adventure enough. The background story, of Rahab helping the Israelite spies to escape from Jericho and The Scarlet Cord she hung out of the window to keep her family safe when Jericho was destroyed, is told in the Bible, the Book of Joshua, chapter 2. This fictional re-telling is exciting and grips your attention as the story unfolds. Suggested for 9+ as there is bloodshed and horror as told in the Bible, but a happy ending for the children. I love the idea of telling the story from the point of view of mischevious children. It's really good. Parents should be prepared for questions about circumcision as this is something important but only explained as an operation from which one needs to recover. Got a question? No problem! Just click here to ask us about The Scarlet Cord.